Regular recordings of accurate weight and measurements of your tortoise are an essential part of its care. Keeping good records allows you to judge whether to increase or decrease your tortoise's food intake, in order to maintain a steady and slow growth rate. If the tortoise is new to you then weigh it weekly and measure its length monthly. For older tortoises monthly weight and length measurement checks are fine. However, if your tortoise is in ill health or gravid, then increase the frequency of checking and return to a weekly weighing routine. These records will become an excellent source of information from year to year and will be invaluable to your vet should a visit be required, and they will also provide you with a good indication as to whether the tortoise should be hibernated. N.B. The Tortoise Observation booklet is also available to purchase. Always wash your hands and clean all equipment before and after weighing and measuring each tortoise. Place the sheet of paper on the floor. Ensure that one end is touching the solid vertical surface and hasn’t gone underneath any gaps. Place the tortoise on top of the paper, with its head close to the solid surface. Very gently push the tortoise towards the wall. Naturally, its head will retract into the shell. When the front of the shell is touching the wall mark the paper directly below the base of the shell at the tail end. 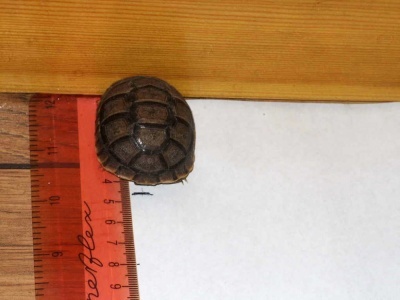 Remove the tortoise and measure and record the length marked on the paper. For larger species of tortoise, an alternative method of measuring will need to be found. If the tortoise is too heavy to lift entice the tortoise towards a wall. Once the tortoise is in place, facing the wall, touch the nose so that the head retracts. Push the tortoise forward so the head end of the shell is touching the wall. Draw a line directly below the base of the tail end of the shell. Measure the distance between the wall and the marker line. Make a pencil mark at one end of a long strip of wood. With the help of another person lay the wood on the floor alongside the tortoise, with the marked end placed at the same level as the edge of the carapace at the front of the tortoise. Mark the other end of the wood directly below the base of the tail end of the shell. Measure the length between the two marked areas. Weigh your tortoise at the same time of day, for example just after it has been bathed (passing urine or faeces or having a drink can make quite a difference in weight, especially with smaller tortoises). Young tortoises can be put directly onto the scales providing ALL of the animal fits on to it. 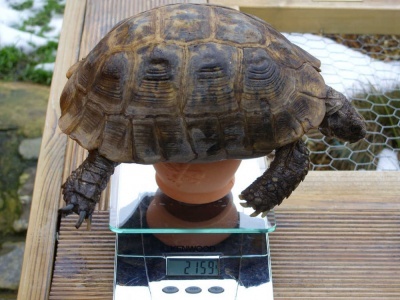 For adult tortoises place a plant pot on the scales and reset the weight to zero. 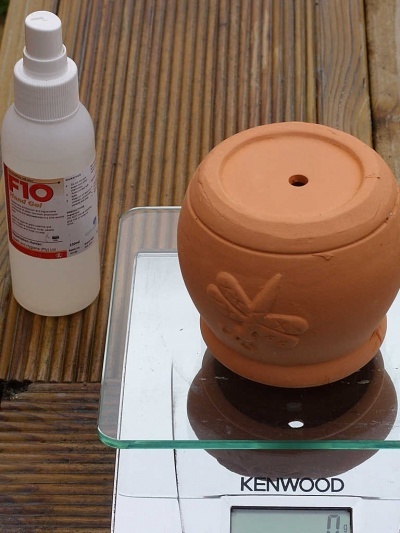 Then place the tortoise on top of the pot, ensuring it doesn’t topple off. Weighing a larger tortoise can prove difficult as most kitchen scales only go up to 5 kg. and larger species of tortoise may prove too heavy to lift. If the tortoise can be lifted then one option is to first weigh yourself on the bathroom scales and record the weight. Then pick up the tortoise and weigh yourself holding the tortoise (you may need a second person to take the reading) and record the weight. The difference between the two weights is the weight of the tortoise. If a vet visit is required the tortoise may be weighed on the larger walk-on scales at the practice. Don’t forget to take a note of the recorded weight and enter the date and weight on your log when you get home. These are guides used for collating data of weight and length with Testudo Hermanni (Hermanns tortoises) and Testudo Graeca (Mediterranean Spur Thigh tortoises). They MUST NOT be used for any other species. During your weekly or monthly weigh-in get to know the condition of your tortoise. In general, is your tortoise bright and alert? Are the eyes, clear, dark and bright? Are the nares (nostrils) clean and dry? Are the nails or beak overgrown? If they are overgrown then ask the vet to show you how to trim them, and ensure that there are stones and rocks available in the tortoise's enclosure to help stop them overgrowing in future. Is the shell clean and free from damage? Is the tail area clean and free from faecal matter? Is the tortoise passing faeces regularly and if so is the poo solid like a little log (if soft then diet may need reviewing)? Is the tortoise passing urine regularly and is it clear? If there are urates they should be runny like egg whites or soft like toothpaste. If urates are solid or gritty then this is a sign that your tortoise needs more opportunities to rehydrate, so bathe more often and ensure that fresh water is readily available. Establish a routine and make regular recordings, as this information may prove to be a lifesaver. These detailed records and close observations can alert you that an underlying health problem is occurring. Providing your specialist veterinarian with such recordings can help create an invaluable picture of the tortoise's health history should a visit to the vet be required. Click here to access our pdf observation chart which can be downloaded and printed out or click here to purchase a copy.